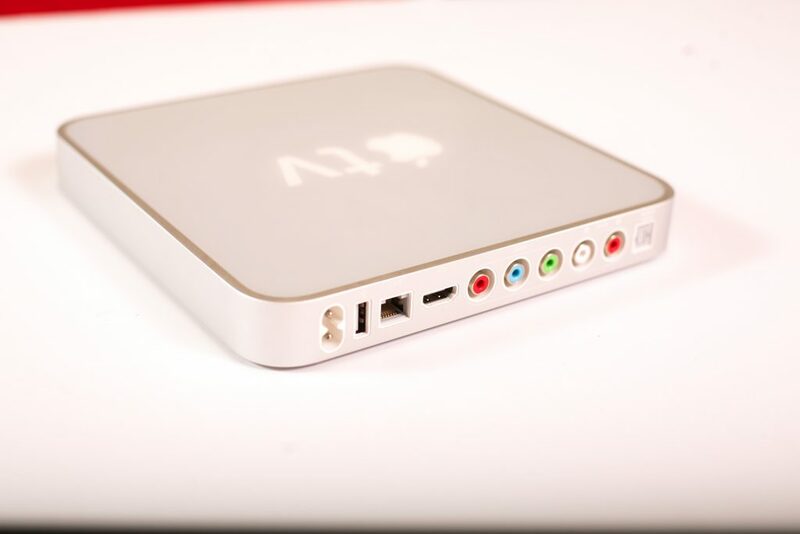 Many have forgotten about Apple’s first-generation set top box, the original Apple TV released in 2007. By the time these went on sale, Macs were already in transition-mode to Intel processors. 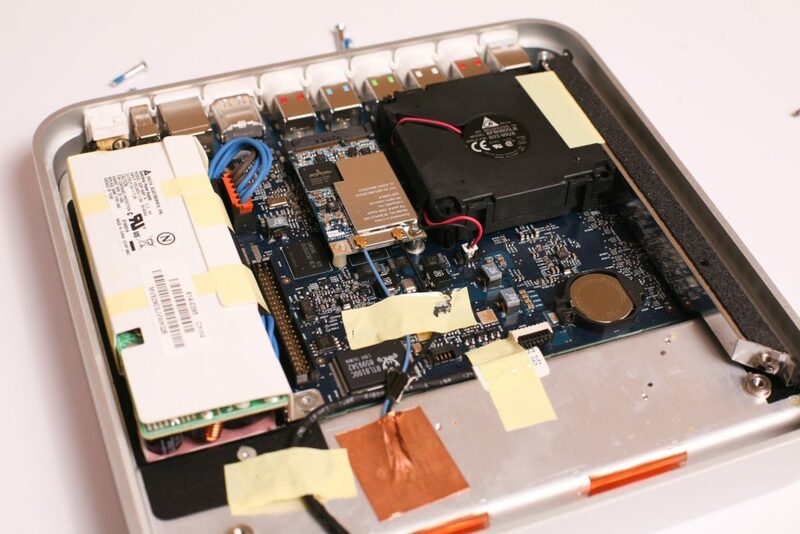 Although Apple’s mainstream computers carried Intel’s then new “Core” processors, the humble Apple TV was relegated to a lower cost, low-powered Pentium M chip (not to be confused with the terrible Pentium 4 Mobile chips). 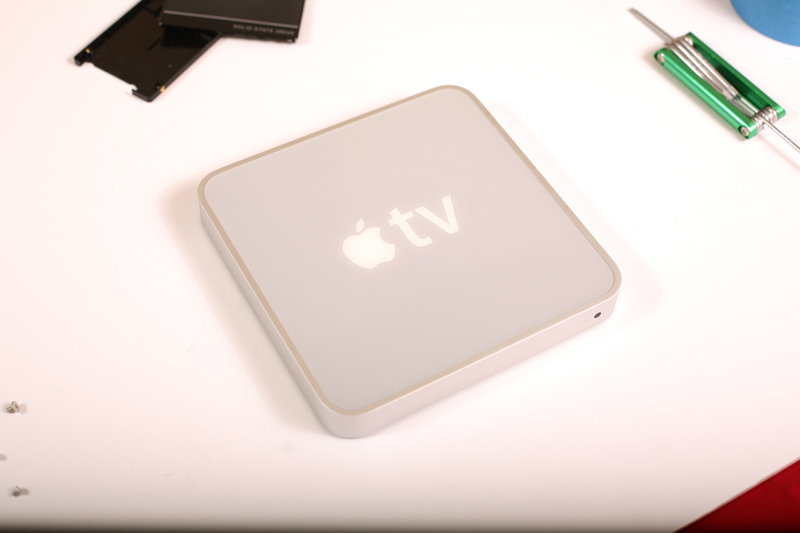 Much like the original Xbox, the Apple TV came with commodity hardware — making it easy to mod and run Linux or something called “OS X.” It piqued my interests, but at $299, I didn’t bite. For reasons I won’t get into right now, I was in the market for a cheap x86 box. Browsing eBay for early Intel Mac Mini’s, I stumbled on this gem for $26 shipped to my door. Intel Pentium M 1.0GHz (Dothan), 256MB DDR2, 100Mbit Ethernet, WiFi, 64MB GeForce Video, 2.5″ 40GB PATA HDD, (1) USB2.0, HDMI, Component Video, 2CH Audio, Optical Audio out. My unit did not come with a remote. The size? It has the footprint of a first generation Mac Mini, just flattened down. The power supply is internal so the power cord is just that — a cord. Taking the Apple TV apart was pretty straight forward. The rubber base (not shown) peels off easily, although I did tear mine doing so. 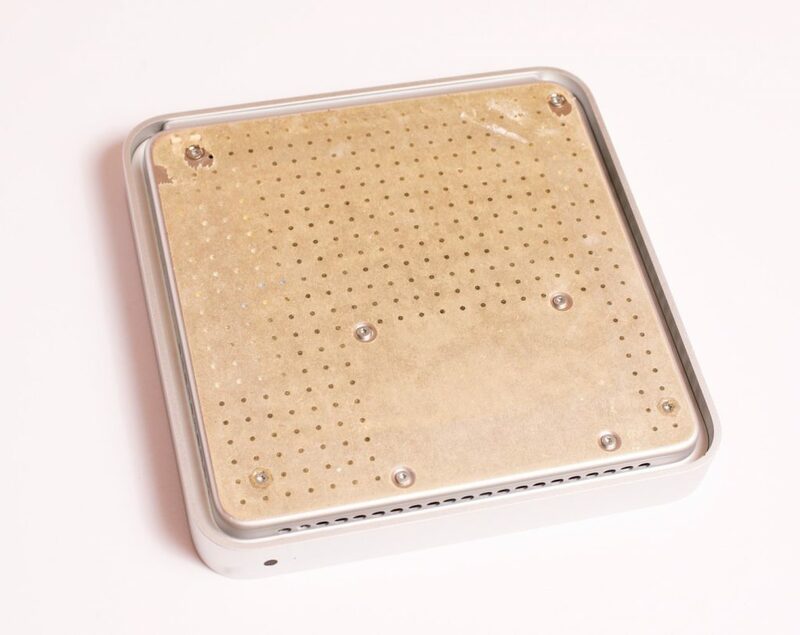 The metal base is held on with four T10 screws. The internal hard drive is also held to the base with four T8 screws. Removing the T8 hard drive screws aren’t required to remove the base. My plan was to replace the 40GB IDE drive with a 240GB SATA SSD for obvious reasons: temperature, power, speed, and storage space. It’s hard to say how much a 240GB SSD would cost in 2007 because no one made an solid state drive that big. I repurposed a $40 PNY SSD for this project. Obviously, I needed an adapter to make this work. You’re looking at a 44-pin IDE to SATA adapter ($8 on Amazon.com). 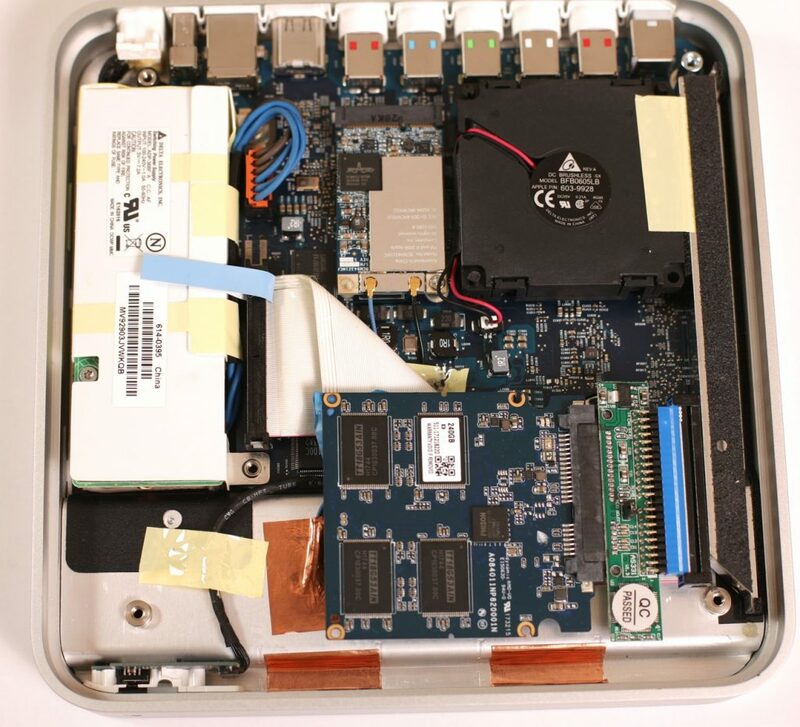 For those of you not familiar, the 44-pin 2.5″ IDE interface also carries power, unlike the more common 40-pin 3.5″ IDE that had a separate 4-pin Molex connection for power. So here’s the rub. The SSD and the adapter are too big to fit back into the case. Removing the casing for the SSD solves that problem. Just be careful when prying the two pieces apart. Here is the final unit before putting the cover back on. 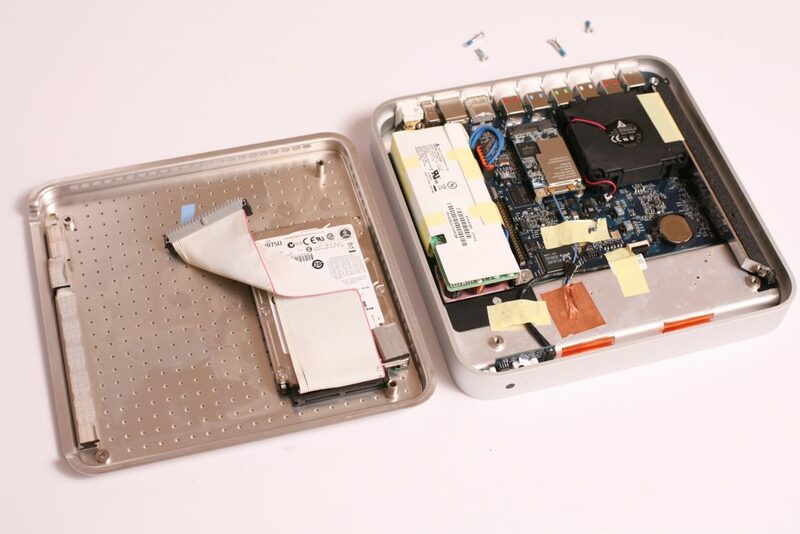 I have nothing holding the SSD in place other than two pieces of plastic padding that sandwiches between the covers. Other than the WiFi card, nothing else in here is removable. The USB2.0 port is your only path to further expansion.